In the last year, John and I cut out a lot of red meat from our diet. I almost always substitute ground turkey, and we haven't felt deprived. The only time I really want actual beef? Burgers. I know turkey burgers can be great, but I usually crave a burger, burger. As soon as I saw this recipe I knew I wanted to play around with it. John asked me to try incorporating mushrooms a bit more - I'm not a huge fan - and I thought this recipe seemed like good baby steps. I broke down the steps below, so you can feel free to omit, add or play around with the toppings however you'd like. I loved how the arugula, cheeses and dijon aioli complemented the burger. The whole thing had a "fancy" feel to it, and I'll definitely make these again, especially with summer weather on the way. If you're looking for a fresh burger idea, this is definitely the one for you. Cheers! *Add ground beef to a large bowl and season with salt and pepper. Add in 1 tablespoon of olive oil and mix it into the beef, then let sit at room temperature for about 30 minutes. *Add 1 tablespoon each of olive oil and butter to a large skillet over low heat. Add in mushrooms and stir to coat. *Cover and cook for 10-15 minutes until softened and juicy. Once soft, add a sprinkle of salt and pepper, turn off heat and keep covered. *While mushrooms are cooking, whisk together dijon mustard, egg yolk and lemon juice in a large bowl until combined. *Slowly stream in olive oil while continuously whisking until the mixture emulsifies and comes together completely. *Whisk in whole grain mustard and horseradish, then taste and season with a little salt and pepper as desired. Set aside. *Toss the fresh arugula with the lemon juice and 1/2 tablespoon of olive oil. Sprinkle with a little salt and pepper. *Heat a large skillet over medium-high heat and add 1 tablespoon of butter. Form the beef into 4 equal patties, then add to the skillet and cook until they reach their desired doneness. 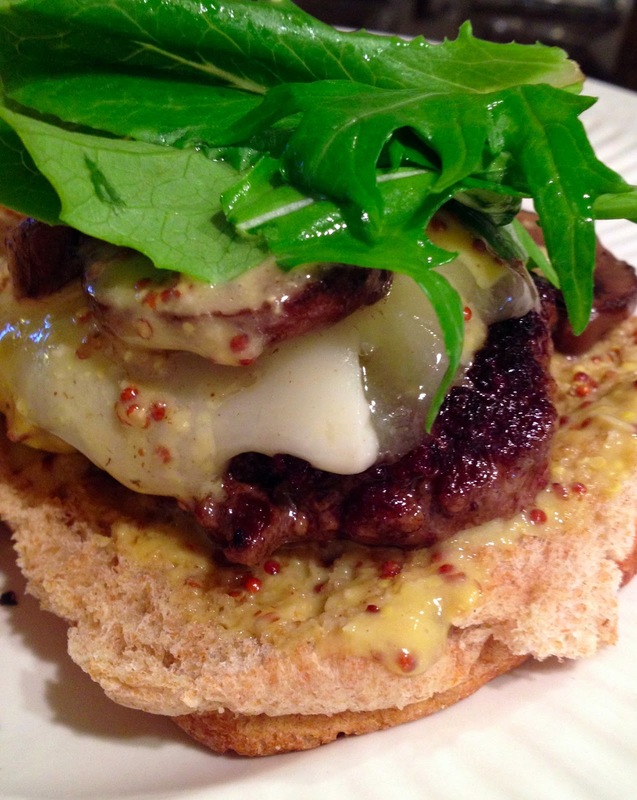 *In the last 1-2 minutes of cooking, top each burger with a few slices of both cheeses. 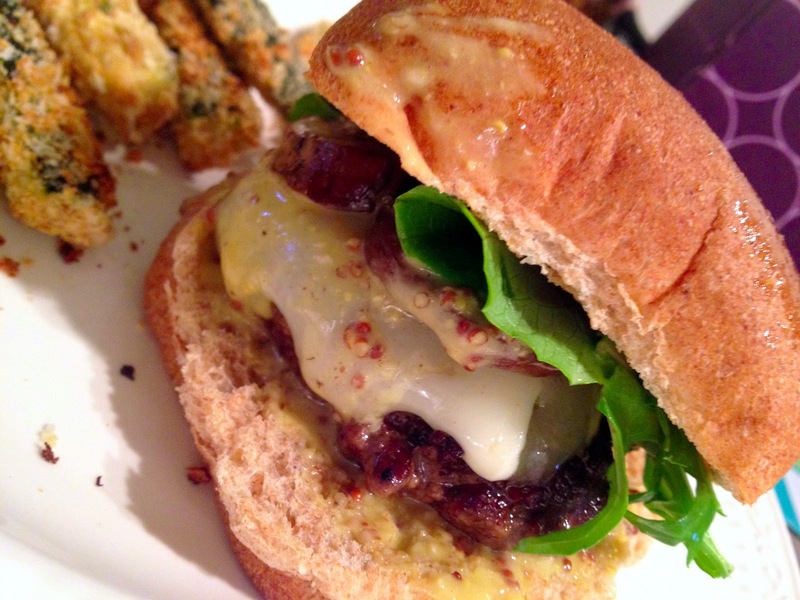 *To assemble burgers, spread a bit of mustard aioli on the bottom of each bun. 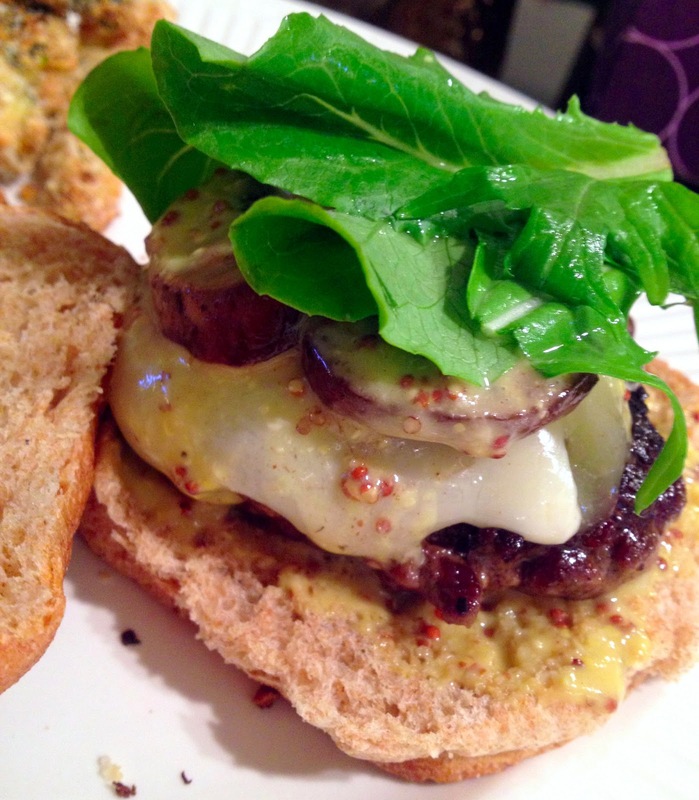 Top with the burger, then some mushrooms, some aioli and a handful of arugula. Oh man, this looks amazing! That aioli looks incredible! It was soooo good! And a bit of an arm workout with all that whisking, haha!